Bradford L. Smith (born 1959) is an American attorney and technology executive, now president and chief legal officer of Microsoft. For Microsoft, he has settled multibillion-dollar lawsuits with other companies and the European Union, has filed multiple lawsuits against the United States government to protect customer privacy, led efforts to bring broadband and technology jobs to rural America, and signed partnerships with the United Nations Office on Human Rights. He has led philanthropic efforts on immigration and education. He has been called one of the most influential lawyers in America. Smith was born in 1959 in Milwaukee, Wisconsin. His father was an engineer and manager at Wisconsin Bell and moved the family around the state several times. Smith graduated from Appleton West High School in Appleton, Wisconsin, where he was student body president and editor of the school paper; while class president, he brokered one of his first deals, a school hall pass system. Smith met his wife Kathy Surace-Smith while they were undergraduates at Princeton University. They graduated in 1981 and continued to Columbia Law School together. They got married in 1983, and spent the school year of 1983-1984 studying international law at the University of Geneva in Switzerland, before returning to Columbia to graduate in 1985. Surace-Smith is vice president and general counsel of Seattle biotech company NanoString Technologies. They have a son, born in 1992, and a daughter born in 1995. Smith's first job after graduation was as law clerk to United States federal judge Charles Miller Metzner. In 1986, he joined the Washington, D.C. law firm Covington & Burling. He had one condition for the job: to have his own personal computer. He was the first person in the firm with one; it ran Microsoft Word version 1.0. Smith worked for three years in Washington D.C., and four in London, running Covington's software practice there. By 1993 he had become a partner. Smith joined Microsoft in 1993. For three years he led its Legal and Corporate Affairs team in Europe, then five years as deputy general counsel, before being named general counsel in 2002. As Microsoft's general counsel, Smith worked as lawyer, politician, and diplomat. In 2001, Microsoft had just settled United States v. Microsoft Corp., a four-year antitrust battle about bundling the Internet Explorer web browser with the Microsoft Windows operating system. Smith's application for the job in late 2001 included a PowerPoint presentation of a single slide that said: "time to make peace." Microsoft chairman Bill Gates and CEO Steve Ballmer agreed. Smith has been described as conciliatory toward competitors and regulators. He led negotiations to settle cases with several of Microsoft's competitors, including AOL Time-Warner, Sun Microsystems, and Be Inc., paying $5 billion to plaintiffs, aiming for win-win resolutions, and garnering praise from their chief counsels. Smith also oversaw negotiations with the European Commission over antitrust accusations, meeting foreign leaders, lobbying, and settling most issues in 2010. Internally, Smith pushed for diversity within the company's legal division, making executive bonuses dependent on Microsoft and associated law firms' increasing employment of racial minority, women, and LGBT employees, and committing pro bono hours for immigrants. In 2008, the goals were not met, and Microsoft executives donated their bonuses to charity; the diversity goals were met every subsequent year. In 2013, the National Law Journal named him one of "The 100 Most Influential Lawyers in America". By 2014, Smith was the longest serving member of Microsoft's top leadership, and considered "a de facto ambassador for the technology industry at large," winning plaudits for diplomacy from State Department officials like Anne-Marie Slaughter and Stuart Eizenstat. He filed four different lawsuits defending customer data against the US government from 2013 to 2016 and was a noted supporter of Apple Inc. when the FBI demanded access to a locked iPhone. He was able to organize a Reform Government Surveillance coalition including rivals such as Google, Yahoo!, and Apple, Inc. to support Microsoft in Microsoft Corp. v. United States, an ongoing case initially filed in 2013 in which the company challenges the right of the United States to get access to a user email stored in Ireland. Smith was promoted to president and chief legal officer of Microsoft in 2015 by CEO Satya Nadella, becoming the first President of Microsoft since Richard Belluzzo in 2002. In these roles, Smith is responsible for Microsoft's corporate, external, and legal affairs, and is also the firm's chief compliance officer. Within three months in his new position, Smith announced the launch of Microsoft Philanthropies, a branch of the company dedicated to donating money and services to the public good. In the following two years, Microsoft Philanthropies donated tens of millions in grants to education and refugee organizations, and hundreds of millions in Microsoft Azure cloud computing services to nonprofits and researchers. As Microsoft president, Smith continued being called a leader of the tech industry on privacy and immigration. He asked the Trump administration for an exception to its travel ban and said Microsoft would defend its employees affected by the revocation of Deferred Action for Childhood Arrivals. Smith called for a "digital Geneva convention" in February 2017 at the RSA cybersecurity conference in San Francisco, reiterated his suggestion after the WannaCry ransomware attack believed to come from the government of North Korea, and presented the idea to the United Nations at Geneva in November 2017. The convention would be an international treaty governing state-sponsored cyberwarfare, protecting civilian infrastructure, and guaranteeing the neutrality of technology companies, to be overseen by an international body modeled after the International Atomic Energy Agency or the Red Cross that would monitor the agreement and identify offenders. Also in 2017, he entered Microsoft into a partnership with the Office of the United Nations High Commissioner for Human Rights that the Office called "groundbreaking" and "landmark", donating $5 million over five years to develop technology to support the Office's human rights work. He led Microsoft into two ambitious initiatives to bring technology to rural America, the Rural Airband Initiative, which would bring broadband Internet access to 12 states by 2022 using unused television channel frequencies, and the TechSpark program to invest in technology jobs in six rural and smaller metropolitan areas, starting with North Dakota and Wisconsin. In 2014, Smith was named to the Board of Trustees of Princeton University for a four-year term. He has been on the Code.org board of directors since 2013, the year it was founded, and on the Netflix board of directors since 2015. From 2016 to 2017, Smith served on the U.S. Commerce Department's Digital Economy Board of Advisors. Smith chairs the nonprofit Kids in Need of Defense (KIND), which he co-founded with actress Angelina Jolie in 2008. KIND provides pro bono free legal support to unaccompanied immigrant children who are facing deportation in eight of the largest US cities. It is funded by Microsoft and donated hours from law firms and corporate departments across the country. From 2009 to 2016, Smith was the chair and a founding board member of the Leadership Council on Legal Diversity, an organization of corporate chief legal officers and law firm managing partners dedicated to diversity in the legal profession. Smith is chairman of the board of and helped create the Washington State Opportunity Scholarship which gives grants to low- and middle-income students earning bachelor's degrees in Science, technology, engineering, and mathematics and health care. The public-private partnership has raised $190 million since its founding in 2011, including $35 million from Microsoft, $25 million from Boeing, and $25 million from the Washington State Legislature. He shares other charity work with his wife, Kathy Surace-Smith. They chaired the King County, Washington United Way campaign for 2011, raising $120 million. They are also prominent supporters of their alma mater Columbia Law School: Surace-Smith co-chairs the school Annual Fund; in 2004 the couple established the Smith Family Opportunity Scholarship, which helps less represented international students attend the school; and in 2017 they became co-chairs of the school fundraising campaign, and made a $1.25 million gift for the Columbia Human Rights Clinic. ^ a b c d e f g Greene, Jay; Reinhardt, Andy; Lowry, Tom (May 31, 2004). "Teaching Microsoft To Make Nice?". Bloomberg Businessweek. Bloomberg L.P. Retrieved December 5, 2017. ^ a b "The 100 Most Influential Lawyers in America". National Law Journal. March 22, 2013. Retrieved January 1, 2018. Online copy seems broken, but a followup confirms Smith's presence on the list: "CORRECTION". National Law Journal. April 1, 2013. Retrieved January 1, 2018. ^ a b c Frean, Alexandra (April 1, 2017). "In a world under cyberattack on all sides, Microsoft wants to fight back". The Times. Retrieved December 6, 2017. ^ Greene, Jay (September 11, 2015). "Microsoft appoints general counsel Brad Smith as president". The Seattle Times. Retrieved December 5, 2017. ^ a b c d e f g h i j Pian Chan, Sharon (February 20, 2010). "Microsoft's chief counsel Brad Smith sharp, able to relate to people". The Seattle Times. Retrieved December 4, 2017. ^ "Brad Smith, President and CLO at Microsoft Corporation". LinkedIn. Retrieved December 4, 2017. ^ a b "Kathy Surace-Smith, Vice President, General Counsel and Corporate Secretary, NanoString Technologies, Inc". LinkedIn. Retrieved December 4, 2017. ^ a b c d Nusca, Andrew (September 14, 2015). "Meet Microsoft's new president: Brad Smith". Fortune. Retrieved December 4, 2017. ^ a b Ho, Catherine (March 24, 2013). "Microsoft's chief legal officer talks about the company's diversity benchmarks". The Washington Post. Retrieved May 4, 2018. ^ a b Wingfield, Nick (July 20, 2014). "Microsoft's Top Lawyer Is the Tech World's Envoy". The New York Times. Retrieved December 6, 2017. Also printed as Wingfield, Nick (July 27, 2014). "General Counsel Brad Smith's influence grows beyond Microsoft". The Seattle Times. Retrieved December 6, 2017. ^ Simonite, Tom (September 8, 2016). "Microsoft's Top Lawyer Becomes a Civil Rights Crusader". MIT Technology Review. Retrieved January 2, 2018. ^ Simonite, Tom (March 1, 2016). "One for the History Books: Microsoft Is Apple's Greatest Ally Against the FBI". MIT Technology Review. Retrieved January 2, 2018. 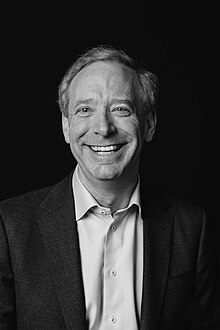 ^ "Microsoft Senior Leaders: Brad Smith". Microsoft. Retrieved December 4, 2017. ^ Slater-Robbins, Max (December 16, 2015). "Microsoft Philanthropy launches". Business Insider. Retrieved January 10, 2018. ^ Lynn-Moses, Sue (May 14, 2017). "Technology for the People: What's Microsoft Philanthropies Been Up To?". Inside Philanthropy. Retrieved January 10, 2018. ^ Romm, Tony (December 6, 2017). "Microsoft's Brad Smith is leading the tech industry into battle on immigration". Recode. Retrieved December 31, 2017. ^ Nellis, Stephen (February 2, 2017). "Microsoft asks for exception program on Trump immigration orders". Reuters. Retrieved December 31, 2017. ^ Rogers, Jeff John (September 5, 2017). "DACA: Microsoft Says Feds Must "Go Through Us" to Deport". Fortune. Retrieved December 31, 2017. ^ Vanian, Jonathan (February 14, 2017). "Microsoft President Brad Smith Calls For a Digital Geneva Convention". Fortune. Retrieved December 30, 2017. ^ Sharman, Jon (October 14, 2017). "North Korea behind devastating 'WannaCry' cyberattack that hit NHS and systems across US, says Microsoft head". The Independent. Retrieved December 30, 2017. ^ Indo-Asian News Service (November 11, 2017). "World needs new digital Geneva Convention, says Microsoft President Brad Smith". The Financial Express. Retrieved December 30, 2017. ^ Weise, Elizabeth (February 14, 2017). "Microsoft calls for 'digital Geneva Convention'". USA Today. Retrieved December 30, 2017. ^ "Technology for human rights: UN Human Rights Office announces landmark partnership with Microsoft". Office of the United Nations High Commissioner for Human Rights. May 16, 2017. Retrieved January 4, 2018. ^ Shaban, Hamsa; Fung, Brian (July 11, 2017). "Microsoft wants to bring 2 million rural Americans online by 2022". The Washington Post. Retrieved January 4, 2018. ^ Kolpack, Dave (October 5, 2017). "Microsoft to help expand rural broadband in 6 states". Associated Press. Retrieved January 4, 2018. ^ Moreno, Ivan (October 19, 2017). "Packers, Microsoft join in tech venture near Lambeau Field". Associated Press. Retrieved January 4, 2018. ^ Dienst, Karin (June 10, 2014). "Nine named to Princeton Board of Trustees". Princeton.edu. Princeton University. Retrieved February 1, 2018. ^ "Leadership". Code.org. Archived from the original on October 18, 2013. Retrieved February 16, 2018. ^ Spangler, Todd (March 30, 2015). "Anne Sweeney, Microsoft's Brad Smith Join Netflix Board". Variety. Retrieved January 2, 2018. ^ "U.S. Secretary of Commerce Penny Pritzker Announces Appointees to Inaugural Digital Economy Board of Advisors". United States Department of Commerce. March 29, 2016. Retrieved January 2, 2018. ^ Leonhard, Woody (August 21, 2017). "Microsoft exec leaves Commerce Dept. 's Digital Economy Board". Computerworld. Retrieved January 2, 2018. ^ "Leadership - Kind". Kids in Need of Defense. Retrieved December 31, 2017. ^ Turnbull, Lornet (October 17, 2008). "Microsoft set to help the littlest immigrants". The Seattle Times. Retrieved December 31, 2017. ^ Preston, Caroline (October 20, 2011). "Microsoft's Top Lawyer Recruits Celebrities and Colleagues to Start Charity". The Chronicle of Philanthropy. Retrieved December 31, 2017. ^ "Brad Smith". Leadership Council on Legal Diversity. Retrieved December 31, 2017. ^ Sloan, Karen (September 18, 2014). "Legal Diversity Council's Efforts Showing Promise". National Law Journal. Retrieved December 31, 2017. ^ Stewart, Ashley (February 9, 2017). "Led by Microsoft's Brad Smith, program gives out $6M in STEM grants in Washington". Puget Sound Business Journal. Retrieved December 31, 2017. ^ Long, Kathering (June 10, 2014). "Big boost in awards for state's STEM college scholarships". The Seattle Times. Retrieved December 31, 2017. ^ Manuturi, Vanesha (June 4, 2013). "State's science, tech students see new opportunity at home". Crosscut.com. Retrieved December 31, 2017. ^ Wattles, Jackie (September 2, 2015). "Can Microsoft and Steve Ballmer help more young people launch tech careers?". CNN.com. CNN. Retrieved February 1, 2018. ^ Heim, Kristi (July 22, 2011). "Local United Way raises $120M". The Seattle Times. Retrieved January 1, 2018. ^ "Columbia Law Receives $1.25 Million Gift from Brad Smith '84 and Kathy Surace-Smith '84". Columbia University. Retrieved December 31, 2017.